Riyadh, Saudi Arabia’s largest city, is home to some pretty impressive modern architecture – and it’s about to get another icon. Oslo-based architecture firm Snøhetta has been selected to design the city’s new Qasr Al Hukum Downtown Metro Station, which will feature an impressive central oculus that will filter light far below ground level to a garden at its base. The station is just one part of a large, world-class public transit system that is currently under development in Riyadh. At street level, a large canopy will shade the entrance to the subway station, and escalators will lead people down to the tracks. The canopy looks like a large stainless-steel bowl, with a cutout in the center, which allows light to pass through to the oculus and garden below. The garden will help to make the station feel like a desert oasis, and it’s meant to symbolize the significance of natural resources in the harsh Middle Eastern climate. The oculus will be filled with reflective surfaces that will shimmer from sunlight during the day, and those panels will reflect street lights at night. “Our proposal for the Downtown Metro provides not only a beacon for a new urban awareness in the city but also a public space, an arena for all the citizens of Riyadh, a citizen space promoting public ownership and a new era of Social Sustainability and civic urban pride,” explain the architects. 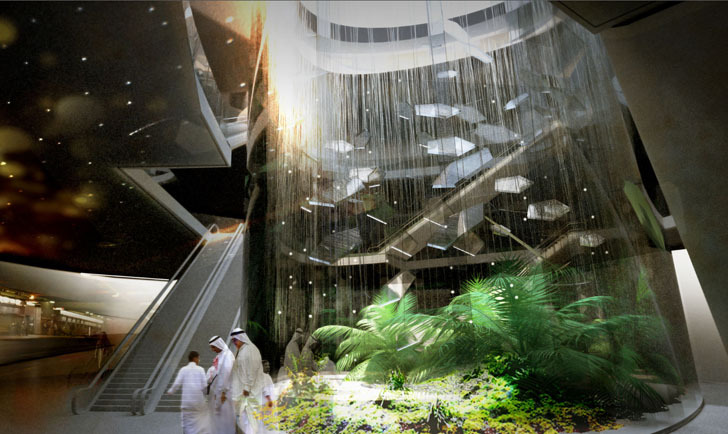 The Qasr Al Hukum station isn’t the only new station that will be added to the Riyadh Metro system; Zaha Hadid’s proposal for the King Abdullah Financial District was also recently approved. The Riyadh Public Transportation network is currently the largest urban transport program in development in the world. Riyadh, Saudi Arabia's largest city, is home to some pretty impressive modern architecture - and it's about to get another icon. 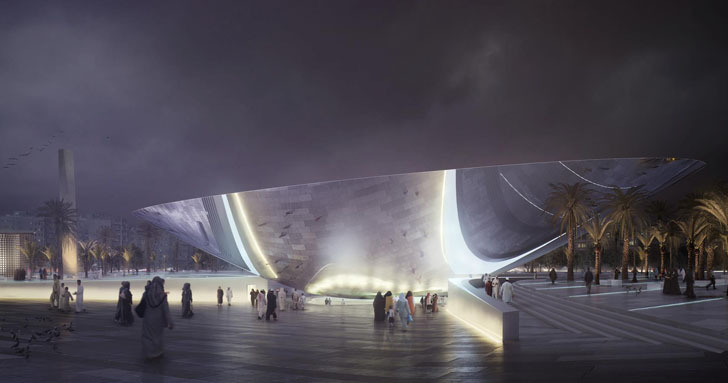 Oslo-based architecture firm Snøhetta has been selected to design the city's new Qasr Al Hukum Downtown Metro Station, which will feature an impressive central oculus that will filter light far below ground level to a garden at its base. The station is just one part of a large, world-class public transit system that is currently under development in Riyadh.